Need to freshen up your professional photo for LinkedIn, business cards, or marketing materials? 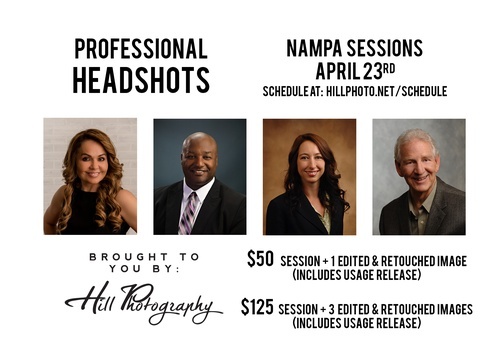 The Nampa Chamber is offering our members the perfect opportunity to get a professional headshot for business or personal use. In partnership with one of our member photographers, each guest will have the option to purchase two available packages. Package one includes an edited and retouched image. Package 2 includes three edited and retouched images. Each package includes a usage release. Schedule your 10-minute headshot appointment and put your best face forward! Photo sessions will be upstairs in suite 215.